Spring is the busiest time of year for my kids, with all the different sports they play. The activity level has already started to pick up and I can feel the stress of getting dinner on the table creeping up on me. Although I love to cook and actually enjoy spending a lot of time preparing dinner (I know some of you think I’m crazy), there are days when there just isn’t enough time to do that. However, just because I don’t have the luxury of spending a few hours in the kitchen cooking dinner doesn’t mean I can’t try my best to put a healthy satisfying meal on the table. It can definitely be a challenge, but with a little planning, and a handful of “secret” sauces, dinner can be on the table in less than thirty minutes. One of the easiest dinners to make that I know my kids will always enjoy is pasta. They could probably eat pasta practically every day if I made it. Spring calls for lighter and shorter preparations, and one of my favorite sauces to have on hand is pesto in all different varieties. The more traditional basil pesto is always a favorite, but so are Basil Garlic Scape Pesto, Swiss Chard Garlic Scape Pesto, Spinach Basil Pesto, and the Sun-dried Tomato Pesto recipe I am sharing today. Pesto freezes well too, so, often, I have a small container of one of these pestos in my freezer to stir into soup or mix with pasta for a quick and easy meal. This past week, I had a taste of what our busy Spring season will be like. I had to leave our house at 4:30PM to pick up one of my kids and wasn’t going to get back home until 8:00PM. So, that meant I had to have dinner ready before I left the house. I started roasting the asparagus and cherry tomatoes and cooking the pasta at 3:30PM, and within 25 minutes, dinner was ready. I had just enough time to take a few photographs of this dish before feeding two of my boys and dashing out the door for the evening. Fortunately, I remembered to pack a container of this Pasta with Sun-Dried Tomato Pesto, Chicken and Roasted Vegetables for my other son that I was picking up from school before heading straight to sports practice. When I pulled out my recipe for Sun-Dried Tomato Pesto the other day, I realized I did not have any fresh basil on hand. Although basil is abundant in the summer here, it is expensive this time of year. 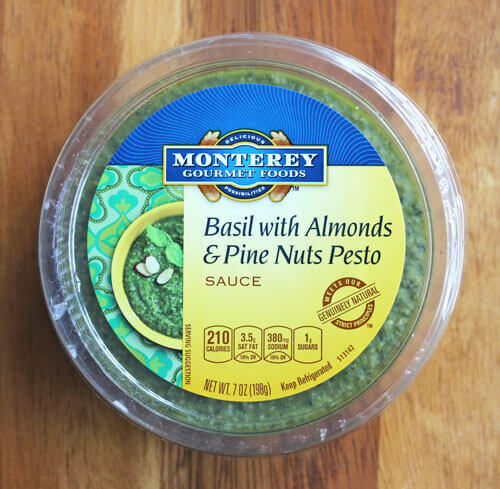 So, when I received a sampling of Monterey Gourmet Foods™ products the other day, including a container of Basil Pesto with Almonds and Pine Nuts, I was thrilled. The basil pesto worked perfectly as a substitute for fresh basil. 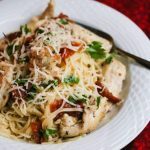 I had never tried Monterey Gourmet Foods’ products before, which include pastas and sauces, but when I learned that their products are all natural, I knew I could use them to make a quick and easy delicious, satisfying, and healthy meal for my family in a pinch. 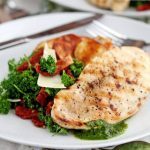 Just a stir-in of basil pesto into marinara sauce, or a spoonful of their Cilantro-Lime Pesto on top of grilled chicken or fish would perk up any meal. Monterey Gourmet Foods follows eight strict All Natural Principles. Their products do not contain artificial preservatives, chemically manufactured additives, artificial coloring, flavoring, or sweeteners, monosodium glutamate, hydrogenated oil, or irradiated ingredients, so you can be assured you are offering the highest quality food for your family. Any products containing dairy/meat are not from cows treated with rBST, rBGH or antibiotics. They also strive for Non-GMO status across their products. I am so glad I pulled this recipe out of my tried and true recipe binder. My kids raved about this meal. I had forgotten how much they loved this recipe. I’ve got more sun-dried tomatoes, so I’ll be making a stash of this Sun-Dried Tomato Pesto for one of my busy days. One winner will receive a $100 Visa gift card and VIP coupons for free Monterey Gourmet Foods product. To be entered for a chance to win please tell me what you would make using a Monterey Gourmet Foods pasta or sauce product. 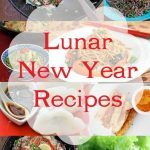 If you’d also like to share a recipe, feel free to post it on your blog/website and include a link to it in your comment. No duplicate comments (entrants cannot enter the same comment twice in order to win). This sweepstakes runs from 4/2/2012-5/31/2012. 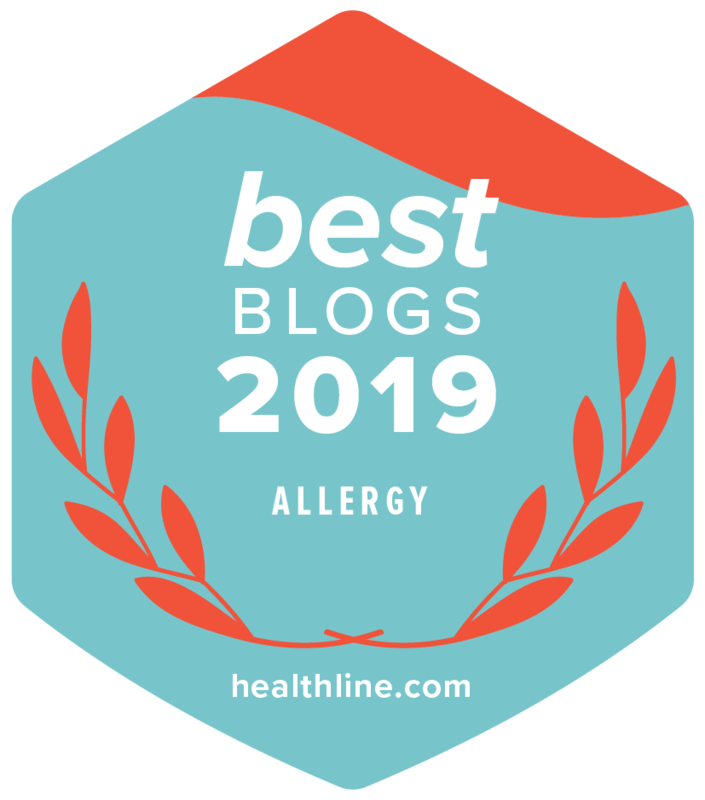 Be sure to visit the Monterey Gourmet Foods page on BlogHer.com where you can read other bloggers’ reviews and find more chances to win! Disclosure: This is a sponsored post. As always, I only share brands I have tried and love! Monterey Gourmet Foods™ is a registered trademark of Pulmuone Foods USA, Inc.
Place tomatoes and garlic in food processor. Process until almost smooth. Add basil pesto and process until blended. With machine running, gradually add olive oil. Add Romano cheese and process until blended. Season to taste with salt and pepper. Cook your favorite pasta until al dente and reserve 1/2 cup of pasta cooking liquid. Whisk some pasta cooking liquid into Sun-Dried Tomato Pesto until desired consistency is reached. 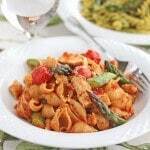 Toss sauce with hot pasta, Roasted Asparagus and Cherry Tomatoes and chicken. I would make the recipe you posted about – it looks mouth-wateringly fantastic! I will have to try it!! One of my son’s loves pesto, the other not so much…wonder if I could get him to like it???? hmmm! This looks right up my alley!! I always cook on the weekend for the week, like you I make sure I have those “go to ” sauces like pesto and tomato sauce and usually a hummus, too. getting ready to plant my new basil plants!!! no shortage of pesto around here!! Can’t wait for fresh basil in the summertime! Hummus is another great sauce to have around. oh, and I will substitute nutritional yeast for the cheese, cuz we are vegan.makes this perfect for us!! Yummy recipe , perfect for a girls night in!! we would make a pesto caprese.. its our favorite! I would love to use their Basil, Almond & Pine Nut pesto to make a pesto chicken pizza! That looks amazing. I will try to make a version without the pinenuts in the pesto since my three old has nut allergies. Thank you for the wonderful recipe! You can definitely leave out the nuts. I’ve done that before. It changes the texture a bit, but it will still be delicious. I’m making this tonight, but will use zucchini pasta instead! I love the idea of zucchini pasta. I have a spiralizer that I need to take out more often to make spaghetti shaped zucchini strands. https://twitter.com/#!/Given2fly46/status/186918020747231233 had to pass this on! Looks great! Can substitute nutritional yeast for Parmesan cheese. Margaret – you are always welcome to leave more than one comment. For the giveaway, the only requirement is that the comment cannot be a duplicate comment. Love pesto and thank you for the giveaway! I would slather pesto on sandwiches and pastas. It’s just that good! That picture of your sundried tomato pesto looks so gorgeous. And what a lovely giveaway! I love pestos and the assortment of them from Monterey Foods is just superb! 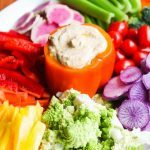 I use pestos for just about anything…mix with pasta, use as a sandwich spread and sometimes even mix some in a dip or season yoghurt! Yummm! I would love to create a Creamy Ricotta Florentine Ravioli with Alfredo sauce using Monterey Gourmet Foods products. Sounds yummy and couldn’t be any easier. I can’t wait to try this combination. The asparagus makes it look so pretty! I would love to try to make that dish. Oh my goodness, that sun-dried tomato pesto looks wonderful! It would be wonderful on so many things – pasta, fish, sandwiches… And I absolutely adore Monterey Gourmet Food products. veggie lasagna! I love making it, every season inspires new combinations. I’d totally make up a quick veggie pizza. Roll out the dough, add the pesto as the base, top with your favorite veggies and cheeses! OMG you’re making me hungry! I’d love to try their Butternut Squash ravioli in a sage butter sauce. We are new to gluten free. I would use this to make a pasta dish with some of the new gluten free noodles we are trying. I am also interested in trying to freeze some of the sauces for future use. i would swap regular noodles for the ravioli in my cajun shrimp pasta. yum!! i love the idea of mixing in pesto to the marinara sauce! for some reason, i’ve never mixed the two together – always separate! good idea jeanette :D. i think i would love to roast veggies in that pesto sauce from monterey gourmet foods! I just made a huge batch of oven dried tomatoes. This will be a lovely way to use them. I would make shrimp with pasta and their cilantro lime pesto. I would make a grilled chicken and pasta with pesto sauce. 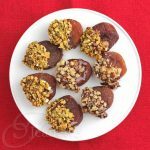 I would love to try this recipe you posted! 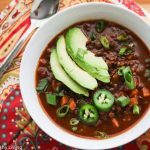 Looks delish, and I could really use some help in getting the ingredients paid for! I’d like to try the Butternut Squash Ravioli. 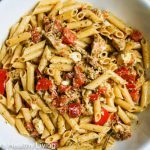 I’m all over this sun dried tomato pesto! Looks marvelous. Would definitely like to give this a try. The pesto sauce looks great! A wonderful giveaway…hope you are having a great week! I’m going to buy me some sun dried tomato pesto today, it looks beautiful and I’m sure it would taste amazing on pasta. Put pesto on ANYTHING and I’m convinced it’s five million times better, This pasta sounds delicious! 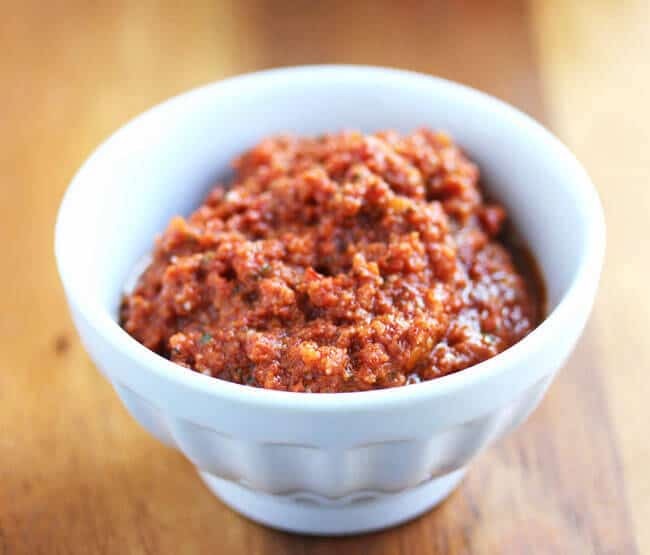 I would use this sun-dried tomato pesto in lasagna with some roasted asparagus. So delicious! Pesto is one my fav condiments. I will eat it by the spoonfuls and on anything and everything. I have to say, I haven’t tried sundried tomato pesto, so I’m going to have to give this a go. i would make ziti! Thanks for a super giveaway! I would make Chicken Marco Polo. I know my family would love the Rainbow Five Cheese Tortelloni. I think I’d use the tomato, basil and mozzarella ravioli and the fire roasted mushroom and four cheese ravioli layered with homemade sauce (or maybe I’d try one from Monterey Gourmet) and little meatballs to make a cheater’s lasagne! I would make Ravioli Soup. i would make some veggie ravioli w/ the addition of some seasonally veggies. i would make a pasta salad with their pesto sauce! I would make Tortelloni salad with their pasta. I’d try their creamy ricotta florentine ravioli and have some en brodo (in broth) and some the next day in a salad,. My parents love pasta, and I love cooking for them! I would make them Roasted Garlic and Chicken Ravioli with the Hearty Garden Marinara Sauce, I’m thinking they would like that! I would live to try the Cilantro Lime Pesto. We eat a lot of pasta and I enjoy using different sauces. I would love to try making pesto pizza using their pesto varieties, especially the Artichoke Lemon. Thanks! 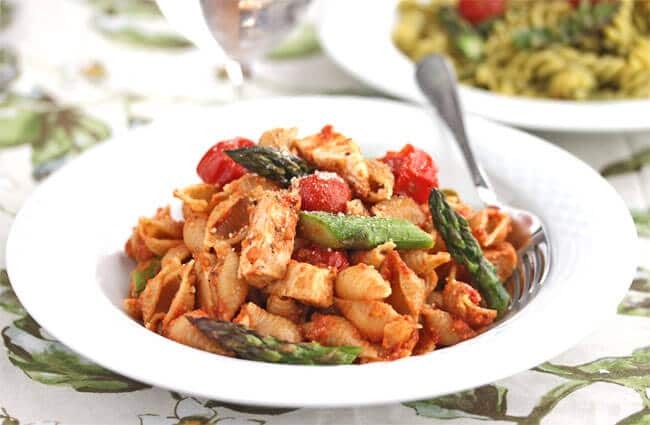 Your picture for the Whole Grain Pasta with Sun-Dried Tomato Pesto, Chicken and Roasted Vegetables is to drool over. I’d also like to make the Lobster Ravioli with Saffron Cream Sauce from the Monterey Gourmet Foods website. I want to make tuna pasta with them. thanks for the giveaway. I’m going to make it with nutritional yeast and use it for paninis with veggies! I would make baked tofu topped with the Cilantro Lime Pesto, or use any of the pestos on homemade pizza… yum!!! I love to top whole grain crispbread with basil pesto or olive tapenade. I top it with fresh marinated mozarella, red and yellow tomatoes and freshly cracked black pepper. 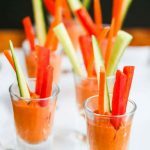 It makes a quick and delicious healthy snack or light meal. I’m not one to use too many prepackaged products because of the amount of sodium in them. I will try this Basil Pesto though in order to make this recipe and judge the sodium level from there. I am new to your website and think this recipe looks delicious. Thank you for the opportunity to enter your contest! love your allergy foods, great healthy dishes. mmmmm! I would make lobster ravioli with alfredo sauce. So many wonderful varieties to choose from! i would make lasagna – it’s one of our favorite dishes! but that Sun dried Tomato pesto you really looks good! but that Sun dried Tomato pesto you have pictured really looks good! The cilantro lime pesto sounds amazing – I would use it in my recipe for chicken enchiladas, which I have transformed for simplicity’s sake into something shaped more like lasagna. I like to call it chicken enchilasagna. The cilantro pesto would be just the thing to kick it up (and would mean I wouldn’t have to buy a big bunch of fresh cilantro, most of which seems to rot before I can use it all). I have made veggie ravioli, with green onions and yellow onions, and some marianna sauce. Even though my family loves pasta, I’ve discovered I can sometimes use rice in place of pasta and they love it too. Especially brown and wild rice. Recently I paired alfredo sauce with brown rice and grilled scallops and it was out of this world! I would love to try Monterey Gourmet Foods Alfredo sauce in my recipes. I’d make Spinach Ravioli Lasagna. I would love to try this pesto on pizza dough or on my lunch sandwiches for an added flair! Thanks so much for sharing! I would have to try my lasagna with pesto! Thanks so much! I love this recipe Jeanette! I have a big jar of sun-dried tomatoes and some frozen pesto. This will be perfect for dinner this week. Thanks for the inspiration!!! I already have my Basil and veggies planted! Can’t wait for the fresh veggies and herbs to make this! Did you know that Basil is considered the “King of Herbs”? Thank you for your website! I love it! I love pesto! I would use it on raw zucchini noodles..yumo! Pesto with almonds sounds like it will be creamier. Your recipe looks yummy! I might give that a try! I would make baked spaghetti. I think I would love the tortellini with their pesto sauce, so that would be the first thing I would make…honestly though, all of the products really look delicious! I’d make their Butternut Squash Ravioli with a brown butter and fried sage sauce. I would love to make a pasta salad that would be delicious as the weather gets warmer. Thanks for the chance to win! I would make some Fettuccine Alfredo w/their Creamy Alfredo sauce. The Monterey Gourmet Foods Product sounds delicious! I would love to make the Roasted Chicken & Mozzarella Ravioli and Basil with Almonds & Pine Nuts Pesto Sauce. Can’t wait to try them! I would make chicken & pasta with pesto cream sauce. Great giveaway! i would love to make the butter nut squash ravioli in an alfredo sauce! I just took a look at their pastas and I can’t wait to try the Three Pepper Tortelloni. I would make some lasagna since it’s my favorite. I would make Chicken Parmesean! I made this recipe tonight. I was AWESOME!!!! I’d love to try the pesto sauce on pizza. I’d love to try Fire Roasted Mushroom & Four Cheese Ravioli with a simple marinara sauce. I would make Shrimp & North Atlantic Lobster Ravioli with Alfredo sauce. Montery’s Tomato, Basil & Mozzarella Ravioli in pesto sauce is my personal favorite! I would loveee to try the Artichoke & Colby Jack Ravioli with alfredo sauce and some parmesan cheese! So many choices, but I think I’d make lasagna first. I don’t cook very much however, I do know how to boil water rather well so I would make the basil and pasta recipe. It appeals to me because it is quick to put together, and seems simple enough to make with little to clean up. Additionally, it sounds absolutely delious. I’d make spinach ricotta ravioli! Yum! Love a quick meal in the summer! I’d like to try their recipe for Pear Pesto Pizza. It sounds amazing! I’d make white pizza using Monterrey pesto sauce instead of marinara. I’d make my own version of Chicken Piccata using their Artichoke Lemon Pesto, chicken, artichoke, and capers! This brand of pasta looks amazing! And from your pictures, it also looks like it really fills you up after eating. I’ve been looking for a good lasagna recipe, but I think I would like some of the Monterey Gourmet pasta and use it to make a lasagna casserole. Thanks for the chance to win! 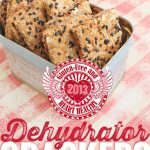 This recipe is absolute fantastic! Thank you for sharing! 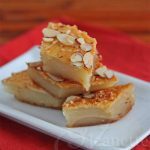 Marion – so glad you liked this recipe – it’s one of our family favorites!